Fans have been with us for thousands of years in one form or another. The earliest references would appear to come from China, whose society was far advanced in pre-history when compared to the rest of the world. A Chinese legend tells of a Mandarin's daughter who attended the Feast of Lanterns and was overcome by the heat of the candles, she removed her mask and wafted it in front of her face to create a breeze, the other women of the court noticed this and copied her actions and so the fan was possibly born. 19th century Chinese Brise Fans (FS20/779) that were sold in a works of art auction for £1,650 in October 2013. The leaf is the main part of the fan, which disturbs the air to cause a breeze. Usually semi-circular, it can be made from a variety of materials such as paper, lace, chicken skin or a textile such as silk. The sticks are simply the framework on which the leaf is mounted and often made of wood, ivory or bone. The end sticks are called guards and when the fan is folded these protect the leaf and sticks from damage. 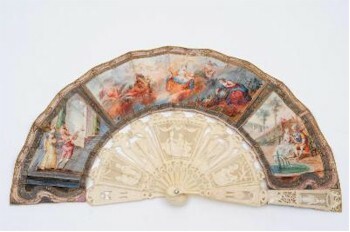 An early 19th century painted fan (FS20/781), which realised £620 in our Autumn 2013 Fine Art auction. During the 18th and 19th centuries, the leaves tended to be of paper or chicken skin. They were generally hand painted with panels depicting neo-classical scenes, mostly related to goddesses. Another popular subject were rustic scenes, usually depicting two young lovers courting in a wooded glade or bower, or figures in vistas of Italianate landscapes. As the 19th century progressed, hand-painted leaves were over taken by lithographed printed leaves, which were then hand tinted. The subject matter was often the same but the printing process meant that fans could be produced more cheaply. As we come to the 20th century, the fan was slowly in decline, although still being used at Edwardian balls, dinner parties and such like. At this point, the leaf had changed and ostrich hurl and peacock feathers were more in vogue. In China, the most well known fan is a Mandarin Fan or "a fan of a thousand faces". The leaf is decorated with numerous figures, often set in a garden or palace setting. Each figure is hand-painted as well as the background. Each figure's face was a small piece of applied ivory with pen work decoration for the facial features. They were usually decorated on both sides of the leaf. The sticks and guards were nearly always black lacquer and are a must have for all fan collectors. 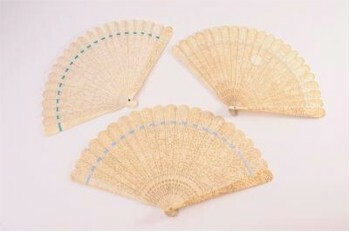 Made and exported from the Canton region of China, they are also known as Cantonese Fans. A cockade fan is where the leaf forms a complete circle and usually has a long handle. The leaf and handle are made from ivory and, as with brise fans, the leaf and sticks are one piece and joined to each other by ribbon. Each section is individually carved and it is not until the fan is fully open does the true glorious pattern emerge.